Not only are driveways, walkways and sidewalks of our homes cause for concern, but we can’t help but bring in snow, ice, sand and salt into our garages. From the little feet of young ones running in from school to the vehicles we park inside the garage at night, the garage floor can become littered with salt, sand and snow almost on a daily basis throughout the winter months. Depending on the type of garage flooring in your garage, there will be slightly different methods of cleaning the garage floors. If you have a bare cement garage floor, the regular collection of snow, salt and sand will likely cause pitting, cracking and other damage. In the spring, consider a garage renovation to get both an effective garage storage solution as well as a long lasting garage floor coating. 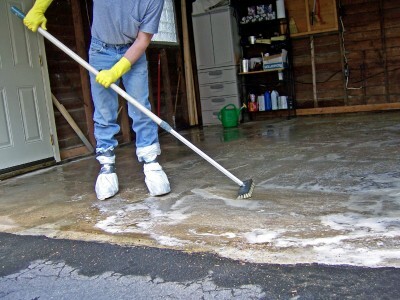 A polyaspartic garage floor coating will protect the floor and ease the care and maintenance of the garage floor. To be prepared to clean the garage floor in winter, you’ll need some supplies. Here are some things you’ll want to keep hanging on your slatwall and in baskets hanging on your slatwall for the winter season. It’s always best to look after the snow and salt dragged into the garage immediately after the vehicle has been parked instead of waiting until everything has melted and the run off water washes and spreads particles over the garage floor. Brushing off your vehicle and knocking the snow and salt build up from behind the tires of your vehicle before you even entire the garage or drive minimizes what gets dragged onto the garage floor. This may not always be possible or you may forget to take this step before driving into the garage. If that’s the case, as soon as you’ve parked your vehicle get the push broom hanging on the slatwall. As you step out of your vehicle, you can knock or brush off excess snow and ice build up and then push it out of the garage with the broom immediately before it has a chance to melt and spread over the garage floor. While the bare cement floor of a garage is not ideal, this winter you may not have a lot of choice. One of the temporary fixes for the winter is to lay down some cardboard on the cement floor. This will help absorb some of the excess water and prevent some of the salt and sand from seeping into the cement. This also helps prevent some of the moisture build up in the cement. Reducing moisture absorption by the cement floor will reduce cracking and pitting of the cement floor. In the winter, garage floor tiles are something which can be purchased and become a DIY project over a weekend afternoon. It’s a more effective solution to protecting the garage floor in the middle winter as it will cause water and salt to sit on top of the floor whereas wet cardboard will eventually allow moisture to seep into the cement floor below. Floor tiles come in a variety of colours and they are modular so that a variety of floor pattern designs can be created. It’s also easy to replace or repair a section of the garage floor if some damage occurs to the garage floor tile. The grip of the surface makes it safer for family members to walk through the garage without fear of sliding or slipping unlike loose pieces of cardboard or wet slippery smooth cement floors. Tiles can be mopped to remove any excess moisture from the garage. Removing the moisture from the garage is important so that belongings stored in the garage remain dry and this prolongs the life of any of our family toys or equipment or supplies. Using a dry / wet vac, any excess melted snow or road salt which you were unable to clean as you parked or as the kids ran into the house can be vacuumed off cement, tiles or polyaspartic garage floor coating. Some people like to use a leaf blower as a dual purpose tool in the winter to blow out light snow which has drifted into the garage. This is possible before things have melted and an alternative to the push broom if that’s not something that you might own. With a blower fan, you’ll be able to reduce the moisture level in the garage instead of having melted snow dissolve road salt all over the floor. It will also help prevent cracking of cement floor if there isn’t either a polyaspartic garage floor coating or a protective garage floor tile. If you’re using cardboard as a temporary solution, it will reduce the moisture in the cardboard before it has a chance to reach the cement floor below. 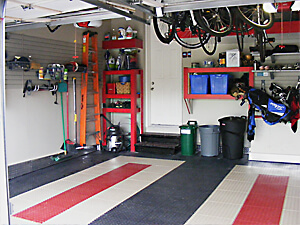 Garage floors such as garage tiles and polyaspartic garage floor coating can cleaned with vinegar and water. The vinegar does lower the freezing point of the water and with a blower fan running for a while afterwards, it will reduce moisture and prevent freezing of any excess water. Especially, if you’re using this method to clean off a bare cement garage floor, the blower fan will become particularly helpful. A more thorough cleaning in the spring would be the ideal when the wet floor will be easier to dry with a little bit of warmth and sunshine. In the winter, the main goal is to avoid moisture and salt from further damaging a cement floor. Ideally, a polyaspartic garage floor coating project by a garage renovation specialist helps protect the foundation of your garage. Each project starts by assuring the moisture level of the cement is adequately low before the application of a polyaspartic floor coating. This step assures that excessive moisture is not somehow locked into the cement. Cement which is too moist will expand and contract excessively during the changing temperatures of the four seasons. In addition to damaging the foundation of the garage, moist cement will also ruin a polyaspartic floor coating application. Starting with an adequately dry cement base means the finished polyaspartic floor coating will have a beautiful and long lasting life in the garage. The beautiful colours of a polyaspartic floor coating are UV protected from sun and other weather elements means it is one of the best garage floor investments for any home. 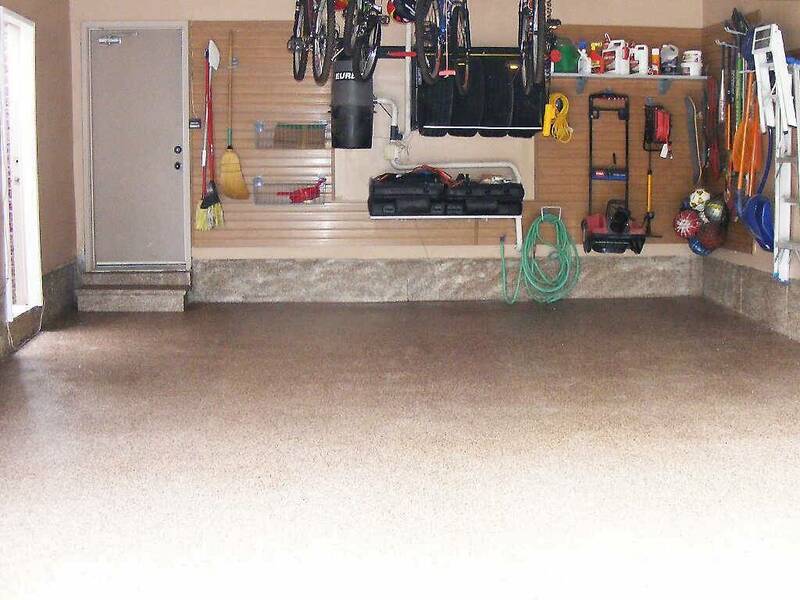 This spring, consider either a full garage storage solution or just upgrading your garage floor with a polyaspartic garage floor coating.